Sorry, but this product is currently out of stock. This item will not be re-stocked. 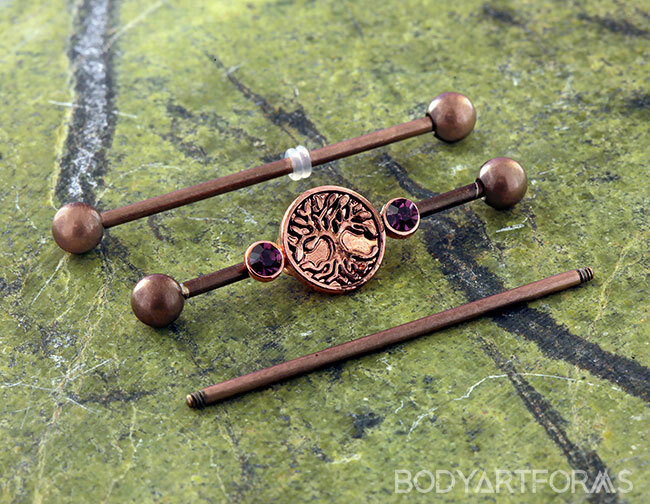 This set includes one moveable 18mm wide x 10mm tall tree of life centerpiece, four 3/16" threaded balls, and one 1-1/4" bar, one 1-3/8" bar, and one 1-1/2" bar. Jewelry is measured through a gauge system (see chart below). The higher the gauge number the smaller the wire is. A standard "earring" is usually 20 gauge. Jewelry gauges/sizes can vary between manufacturers. There is no universal regulation on companies to make a standard size in body jewelry. A big part of this is that some jewelry is made overseas and measured in millimeters. And in the USA jewelry is measured in inches/gauges. So many times jewelry can be anywhere from .5mm to 1mm different. 00g 9mm to 10mm 3/8"